What Paint is Best for Paper Mache? Your paper mache sculpture is dry, and now it’s time to paint it. Which kind of paint will work the best? In the video below, I tell you why I always choose acrylic paint, and three different kinds of acrylic paint that you can use. Some of them are cheap and easy to find, while others are more professional but also more costly. 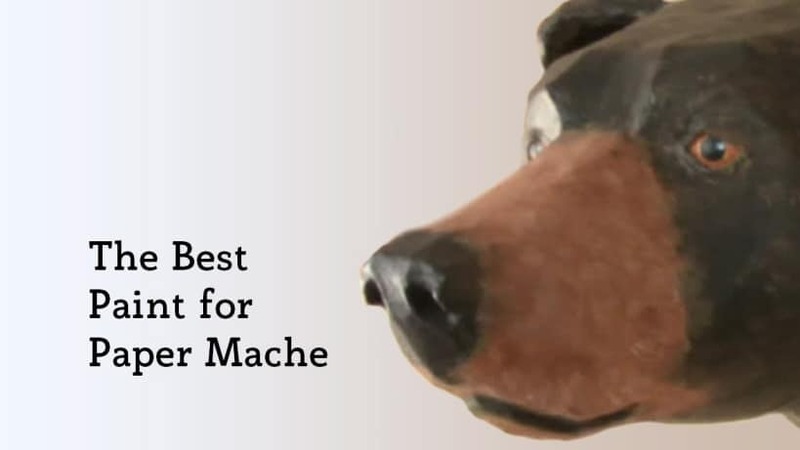 By the way, this video is part of a series I created for people who downloaded my new guide, The 5 Best Recipes for Paper Mache. If you don’t have it yet, don’t miss out – just click here and I’ll send it to you right away. You can use any paint on paper mache that you can use on paper, but almost all paper mache artists use acrylic paint. It dries quickly and it’s easy to find acrylic paint in any art or hobby store. But what type of acrylic paint is best? That depends on your budget and the look you want for your finished sculpture. Hobbby Paint or Artists’ Paint? This is really the most important decision. Artists paint, like Liquatex and Golden, are made to last many years. They have more pigment in them than hobby paint, so the colors are strong and clear, and colors will be easier to mix. I have had trouble in the past with hobby paint that was too cheap. I bought a 24-tube set at WalMart for $12 and used it for my very first attempt at painting an abstract mask. (I mentioned that disappointing result in the video on this page.) Even when the colors weren’t mixed at all, they dried muddy and dark. One of these days I intend to repaint it with better supplies. On the other hand, I’ve been very happy with the Apple Barrel and Waverly brands that I also bought at Walmart, and the Deco Art Americana Chalk Paint that I ordered from amazon.com. I really like the soft finish of the chalk paint, especially if you use the stencil-type brush when applying it. However, I did find that it dries out fast if you don’t get the lid on very tight, and it can separate in the container if you don’t use it very often. Be sure to stir it before each use. You can watch a video of my baby unicorn and the chalk paint I used for it here (scroll down to the second video on that page). If you’re thinking about using hobby paints, try some on a small project and see if you’re happy with the results. On the other hand, you really should use the professional grade acrylic paints if you intend to sell your sculptures. Your buyers will expect it. Do you have trouble mixing colors? I wrote a post a few years ago about a book that completely changed the way I think about color. You can see that post here. The book is now out of print but you might be able to find a copy in your local library, or a used copy online.